Graziani was a significant figure in the Roman baroque period. He was a Jesuit and maestro di cappella of the Chiesa di Gesù, the Jesuit Church in Rome. Church music for liturgical use at this time was set for several voices, accompanied by a variety of instruments. 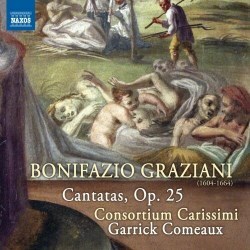 Graziani was a contemporary of Carissimi, though editions of his music are more satisfactory. Many of Graziani’s pieces were printed in his lifetime. After his death, his brother published 14 collections of his works. Naxos are producing another of their many series – this is volume 2. Volume 1, also by Consortium Carissimi, is available on Naxos 8.573256. All the known works by Graziani are vocal. Op. 25 has 14 pieces, of which 12 are recorded here. Some are secular - written for palace use. The longest piece on this CD, Ecco aperto l’abisso, is a dialogue for two sopranos and tenor. It is a grim poem, as the title suggests, gazing into the horror of the abyss where the guilty dwell – as the translation (available online) tells us. There also dwell Cerberus, Pluto, vipers, dragons, sphinxes, geryons, vixens and chimeras and various other gods and demons and ‘as if the fires of hell were not enough, the countenance of the tyrant of hell is an inferno in itself’. Things get grimmer from there on. The ending is a moral warning for humans to learn from these pains. The music is designed to emphasise these elements. The admirable tenor, Roy Heilman, has immaculate diction – every word is clear. The sopranos, Bergen Baker and Heather Cogswell are bell-like in intonation and sing with understanding and appropriate ornamentation. For me, the most affecting pieces are the more specifically devotional, especially Peccator dimmi perché and Su lieto mio cuore. The former is for the same voices as Ecco aperto l’abisso while the latter is for solo soprano (Bergen Baker). It is interesting to examine how different types of intensity are achieved by the same singers in these different contexts. There is evident sensitivity to texts beyond mere beauty of tone and accompaniments throughout are sensitive and varied. This is a significant disc, and a delight not just for those familiar with the period. Performances are uniformly excellent and recording quality is clear throughout. Individual voices can be heard easily. I look forward to more from these forces.